Vision Mart has all of the eye care products you need to see well and take care of your vision health. Achieve perfect vision with contact lenses. The advantages of contacts over glasses include worry free sports activity and no foggy lenses in cold weather. We personally fit all contact to the size and shape of your eye and of course, your prescription. We have soft and gas permeable contact lenses for nearsightedness, farsightedness, and astigmatism. The right frames can not only help you see better, but can also boost your confidence and add style to any outfit. Vision Mart has a wide selection of glasses for kids, teens, men, and women from major designer brands and many simple, affordable options. Our associates will custom fit and adjust the frames you choose to your face and our optometrists will help you select the best type of lenses for your prescription and lifestyle needs. We can cater to your vision needs, including astigmatism, anti-glare, transition lenses, progressive lenses, sports frames, scratch resistant, and much more. In addition to standard lenses, we have bifocals and trifocals available. Vision Mart is the place to go for stylish fashion and prescription sunglasses. Investing in prescription sunglasses will make it easy for you to protect your eyes without having to wear contacts or use clumsy clip on lenses. If you don’t need prescription glasses but are looking for a stylish, affordable pair of high quality sunglasses, we have non-prescription pairs as well. 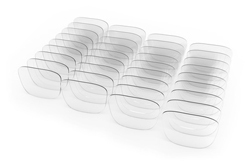 Our Farmington vision center also has glasses and contact lens cases. We carry glasses cleaning solution, contact solution, cleaning cloths, glasses chains, and glasses repair kits. Vision Mart has everything you need to see 20/20 and conveniently maintain your glasses or contacts.